Showtime Shane of Cheltenham, England has become a fixture of family events and parties across the Gloucestershire and beyond. When families see Shane’s colorfully branded van outside a venue, they know that they are in for a fun time. A lifelong fan of magic and performing arts, Shane started performing seven years ago. 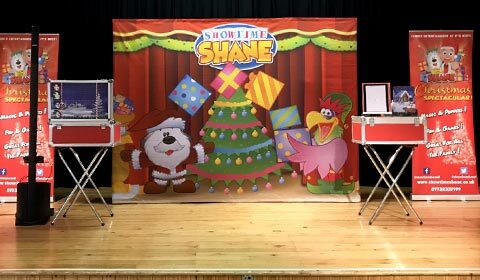 Each Showtime Shane performance is filled with magic, puppetry, interactive games and lots of laughter. Shane’s popularity with kids (and parents) grew quickly, and three years ago he became a full-time entertainer. Shane has also created special performances for both the Christmas and Halloween seasons. These seasonal productions have special props, stage sets, and backdrops all themed to the holidays. 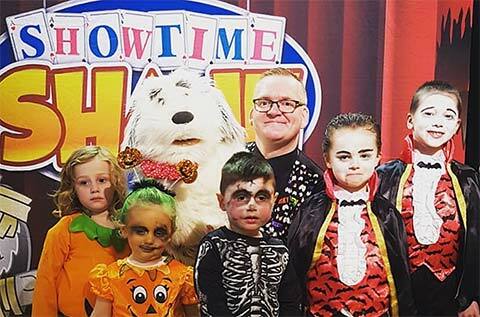 In 2018, Shane presented his “Halloween Mega Party” Show as a full-scale, theatre-based show that provided a kid-friendly Halloween attraction for families of Cheltenham. Many families turned out to be entertained with a mix of Halloween comedy, magic, and puppets in a festive celebration. Showtime Shane's stage set for his Christmas show. Shows To Go (STG) Backdrops is a leading source for made-to-order, custom printed, portable backdrops and large format banners and stage backdrops. We have been helping customers around the world make big impressions since 2005.